Description: Capacity-building initiatives in the biodiversity-rich limestone forest of Biak-na-Bato National Park have transformed natural resource extractors into vigilant stewards, giving this conservation site a fighting chance against the damage caused by marble quarrying, illegal logging and charcoal-making processes, and encroachment by illegal settlers. An aquifer of potable water – from rivers Balaong and Madlum – for residents of the adjacent municipalities. 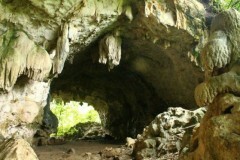 Features about 100 mostly unexplored caves which create eco-tourism opportunities. Part of the geographical base of the Angat watershed, one of the most important water sources of the Greater Manila Area. Orchids, trees, shrubs, ferns, bushes and bokawe (buho) are some of the flora than can be found in the park. Preliminary faunal surveys identified 177 species – two amphibians, 67 arthropods, 81 birds, nine mammals, and five reptiles. Home to diverse wildlife that includes notable endemic species such as the kalaw or the Philippine hornbill (Bucerous hydrocorax), spotted wild boar (Sus philippinensis), and Philippine deer (Cervus marianus). Also present are cloud rats, monkeys, monitor lizards, and swiftlets. Historically significant site, being the area where Gen. Emilio Aguinaldo retreated to after ordering the execution of fellow revolutionary leader, Andres Bonifacio. Rampant marble quarrying and mining operations destroy the aesthetic quality of the park and alters the geological profile of the mountains, affecting its function as a natural aquifer. The park faces the challenge of protecting its wildlife and natural environment from man-made destruction. Poaching of wildlife is widespread. Illegal logging and charcoal-making practices remain unabated. Illegal settlers are continually encroaching into and beyond the buffer zone. Biak-na-Bato was first declared as a National Park in 1937 by then President Manuel L. Quezon, with an area of 2,117 hectares. Succeeding presidential proclamations have slashed almost 70% of the park’s original size in order to accommodate extractive practices. The strong anti-mining campaign of partner POs and the local government led to the suspension of mining operations permit of Rosemoor Mining and Development Corporation, a limestone quarrying company, in 2006. Likewise, all mining and quarrying permits were cancelled by the DENR in the same year. Capacity-building activities including vigorous advocacy work strengthened the people’s organizations and led to the formation of the Buklod-Unlad ng Dalitang Umaasa sa Kalikasan (BUNDUK). The advocacy aspect entailed distributing reading materials, drafting and passing resolutions, and lobbying them in the House of Representatives. Improvement in confidence and ethical and political maturity among the POs involved, which now allows them to be more vocal and proactive with their conservation concerns for the site. Case in point: The POs were involved in the drafting of the Initial Protected Area Plan (IPAP), which has led to the inclusion of Biak-na-Bato National Park as a protected area under the National Integrated Protected Areas System Act of 1995 (RA 7856). A significant number of individuals formerly involved in extractive activities such as illegal logging and quarrying have exhibited a dramatic change in perspective regarding valuing the rich ecological resources of the National Park. Now, they are at the forefront in defending and protecting this natural heritage from further exploitation. Alternative livelihood activities such as food catering, tour-guiding, goat-raising, and rice and cassava production have been introduced to the concerned communities. A socio-economic profile of the six barangays has been conducted, providing important complementary information alongside the biological profile of the site as a whole. Land and resource-mapping, by way of community training. Greater public support for the conservation of the BNBNP’s natural resources have also come as a result.